Performers include: Vanessa Hudgens, Alan Tudyk, Ron Funches, Danny Pudi, and Christina Kirk. This comedy series is set in the DC Comics universe that’s also occupied by heroes like Superman, Batman, Wonder Woman, and The Flash. As the series begins, Emily Locke (Vanessa Hudgens) has her first day as Director of Research & Development for Wayne Security, a subsidiary of Wayne Enterprises that specializes in products that make defenseless bystanders feel a little safer. She’s full of confidence and has big ideas but Emily quickly discovers those are a bit beyond her new boss, Vanderveer “Van” Wayne (Alan Tudyk), the black sheep of his family. Her well-meaning officemates include Chief Design Officer Teddy (Danny Pudi), Chief Engineer Ron (Ron Funches), and Jackie (Christina Kirk), Van Wayne’s beleaguered and long-suffering executive assistant. It’s up to Emily to lead the team toward their full potential and the realization that you don’t need superpowers to be a hero. What do you think? Do you like the Powerless TV show? Do you think it should have been cancelled or renewed for a second season? 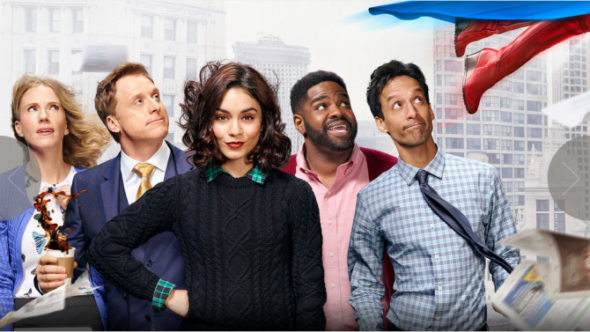 Powerless: Is the NBC TV Show Cancelled or Renewed for Season Two? Why did this show get cancelled, it was really good! This is yet another great show that gets canceled without NBC ever supporting. I hope NETFLIX’S picks it up to show NBC what they gave had and through away. Very disappointed I really liked this show!!!! Actually I love this show! I grew up reading comic books. I love Vanessa Hudgens, Allan Tudik, Danny Pudi and Ron Funches. There’s a ‘Community’ feel to the show because the humor. I was craving more comic book shows after my Netflix binge of Daredevil, Jessica Jones, Iron Fist, and Luke Cage Marvel fix. I wasn’t into D.C. But Vanessa makes it fun. Please keep it coming NBC. Superstore also!!!! I love this show. It is so funny. I love the characters especially Vanessa Hudgens. She is adorable. My 13 year old and husband also enjoy it. I hope it stays! I have to agree with S walker, there is no need for the language that was used. But, I do like the show and I think it should be keep around a little longer. I think it’s a funny and quirky show. I hope they keep it around a little longer and let it develop. Shows use to have a lot longer to develop. I was just watching this show-Powerless at 8:30pm, and I heard one of the characters call someone a pu$$y. This was appalling, especially for this type of show, which is watched by children. I was absolutely disgusted at this, and will not be watching this show again.